同时看到导管内癌与浸润性导管癌。值得注意的是中心处筛型且有明显微钙化的导管内癌组成部分。其周围是浸润性癌细胞。 Both intraductal and infiltrating ductal carcinoma are seen here. Note the intraductal component in the center with cribriform pattern and prominent microcalcifications. 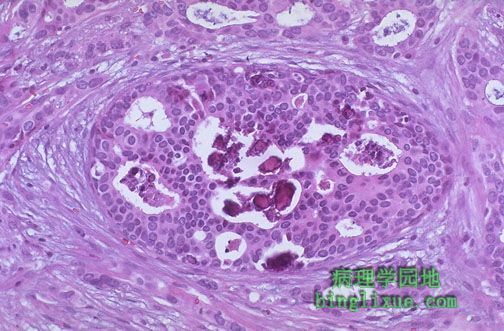 Surrounding this are infiltrating carcinoma cells.